I see many Dutch signs, or what I mean is signs in the Netherlands apparently written in English that at times make my skin crawl and sometimes leaves me livid with rage. Why, I ask myself don’t they employ a native English speaker to do a once over before they make the signs? Obviously, the Dutch pride themselves in being able to communicate in English and I am learning a lot from a Swedish-Dutch friend who is studying to become an English teacher. I never knew it was so much hard work all because it comes so naturally to me and I am almost a purist – God forgive me. The other day, we went out to one of those man-made beaches on the shores of a man-made lake in the middle of Rotterdam and as we were leaving there was a sign in Dutch with an English translation probably to cater for the more international crowd. The Dutch can so easily fall into error when translating to English because they have the same words for belief and faith, grace and mercy, to bring back or to take somewhere – really too many to mention. I will not even go into announcements that sound like the finality of life as we know it when we arrive at station terminuses. Swimming water? I’ll say no more but that was enough for a good 10-minute conversation with my teacher friend about correctness, rigour and the use of English even in a non-English-speaking country. The one that gets to me the most is when I pass by passport control at Schiphol airport and the sign read. Please keep your passport and boarding pass ready. Keep is passable English, have will have been more correct. 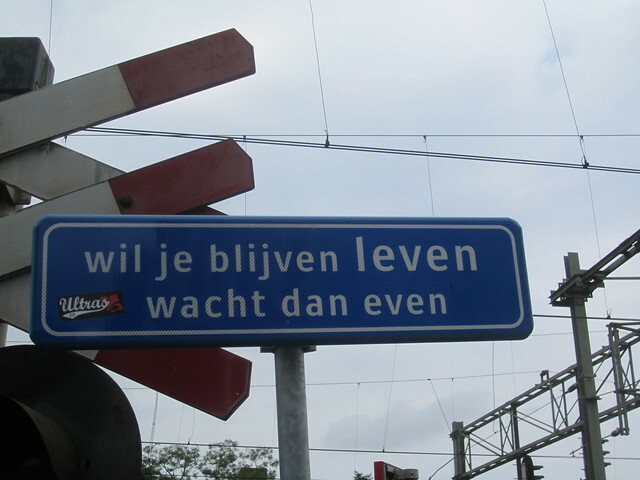 Then Dutch signs themselves can be quite interesting and it was Saturday on my way to a wedding that I read the sign below at a railway crossing. It simply translates to – Will you stay alive? Then just wait. I suppose the impatient risk being road kill or in this case rail track kill – after crossing, the barriers came down and that was a good 5-minute wait before they came up again allowing for three trains to pass that I really thought the crossing needed a bridge. I have not known the Dutch to be that patient but on matters of life and death, I guess they’ll wait to live than rush to die.